The Mercedes-Benz W136 (and similar W191) was Mercedes-Benz's line of four-cylinderautomobiles from the mid-1930s into the 1950s. It became the foundation on which the company rebuilt after World War II because the tooling had survived Allied bombing. From May 1949 the car was offered with an exceptionally economical 38 PS (28 kW; 37 hp) diesel engine. This was the world's third diesel fueled passenger car, and the first to be introduced after the war. The Mercedes-Benz 170 SV and 170 SD were also built briefly in Argentina from 1953-1955 in sedan, taxi, station wagon, pick-up and van versions. During the thirties and into WWII, the German police used a variety of weird and wonderful open topped and doorless vehicles. These were all variations on existing passenger vehicles and could also include busses with trailers, each similarly open to the elements. This kit portrays the Mercedes 170V cabriolet so modified into one of these vehicles. As MasterBox had previously done the 170V cabriolet, it was not unexpected that they would do another kit based on that car so that many of the common sprues could be used. And such is the case with this most interesting police vehicle. Anyway, most US car modelers would probably be used to a single piece body, but this doesn't fit the usual European way of doing things, so the body itself is in multiple sections, all to be fit onto the floor piece which also includes the front fenders. 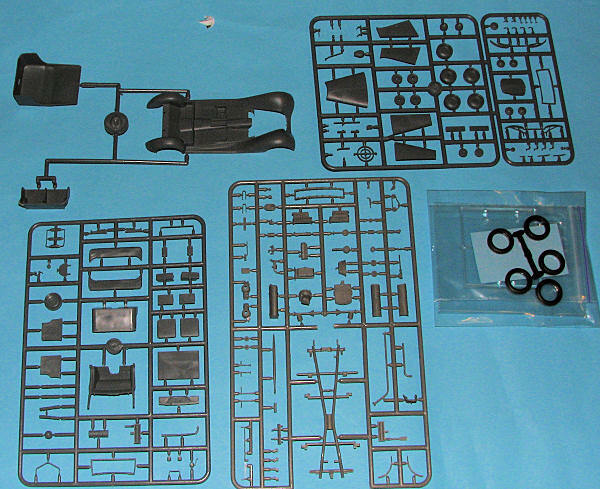 The kit is not a curbside and includes a full engine with complete suspension pieces. Five rubber/vinyl tires are also included. As the car is a cabriolet (which means it has a soft top), one can build this one with the top up or down. Unlike their previous boxing, this one does not have doors and has an abbreviated boot. In this latter case, there are equipment boxes on either side of the spare tire. The 'bodywork' around the rear seat is quite different as are the seats in this one. The only option aside from the raised or lowered top is the ability to have standard or low light headlights and there are rifles that can be installed on a mount behind the front seat. One thing I noticed right away is that the instruction sheet is huge. It consists of CAD drawings for the various construction steps. There are a very large number of construction steps, each showing any modifications needed. As seems to be the trend with some companies, there is no color information included during the build. 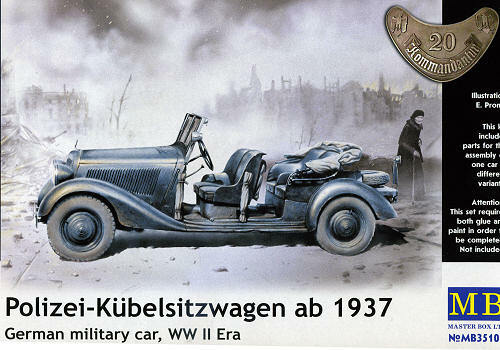 The back of the box is the only painting guide and shows the vehicle in Panzer Grey. The nicely printed decal sheet provides license options for three vehicles. Instrument and tire pressure markings are also on the sheet. This is a pretty neat kit that will certainly raise some eyebrows and elicit questions from those who see it. I would recommend this to experienced modelers as much due to the large number of very fine and petite parts as anything. One will have to be very careful in removing these bits from the sprues to keep from having them launch off into netherspace or breaking on the sprue. Thanks to www.dragonmodelsusa.com for the preview kit. You can get yours today at your local hobby shop.